Japanese arcade games feel like this last bastion of absurd games I’ve never actually heard of. Whenever there’s an anime style fighter that I’m struggling to read the title of, you best believe it’s an arcade game, and you best believe there’s waifus. Koihime Enbu Ryo Rai Rai is another one of those titles which approaches combos and combat slightly differently from your typical 2D anime fighter, and despite my initial impressions, might warrant a spot alongside your favorite fighters. Maybe. If you’ve ever played Guilty Gear Xrd, then the visual style will be familiar to you, but it’s not quite right. 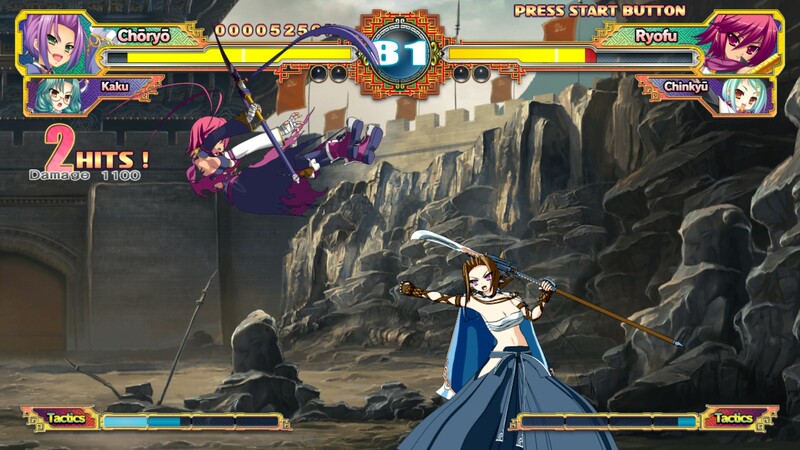 In Guilty Gear, the team at Arc System Works slowed the animation speed of their 3D models to mimic the classic animation of 2D sprite fighters, and in Koihime Enbu we see a similar effect, but unfortunately it just doesn’t quite hold up to scrutiny. To be clear, it looks fine, but in comparison with the fluid 3D animations some fight fans will be used to, it can be off-putting. It feels cheap, unfortunately, and doesn’t make the best first impression. Luckily, what really counts – clarity of animations so you can accurately estimate hitbox range – is done well. Characters move around in a crisp 60FPS, as you would expect, and you never feel like characters are unresponsive. The cast in Koihime Enbu Ryo Rai Rai doesn’t feel like the most original, though. It’s a struggle to look at the character select screen – which is bigger here in the Ryo Rai Rai edition than ever before – and see anything but generic anime girls. The fact that on the character select screen you can only view them in the form of anime portraits doesn’t help much either. And, again, not to be too picky when it comes to the art style, but the 3D models you see in battle and in the character select screen are just completely different and disorientating. But it’s okay. It’s okay. Because Koihime Enbu Ryo Rai Rai actually plays really well. You don’t combo quite like in traditional fighters – you can’t just mash A, B, C and hope a combo happens. Here you’ll be using Lift Offs and Slams – essentially new names for launchers, wall bounces, OTGs – to extend combos. Using these gives you a Pursuit Chance, which is just an opportunity to extend your combo, and you can chain multiple of these to keep combos going. It actually allows a surprising amount of freedom in the way you play, since you can pick and choose which moves you can chase with, instead of sticking to a linear flowchart combo system. But the complexity found in the combo system brings up another problem – there’s no tutorial mode whatsoever, and you will likely have to go outside of the game and online in order to learn the mechanics and characters properly. This has always been a problem with fighting games, and unfortunately, thanks to its art style, Koihime Enbu is already going to be compared to Guilty Gear Xrd, which happens to have a wonderful tutorial. 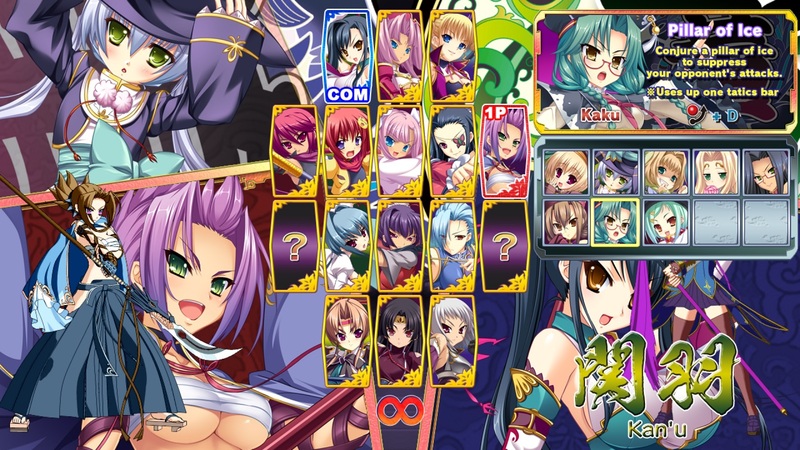 Compared to its contemporaries then, Koihime Enbu just doesn’t feel like a complete package. But other things fighting game fans celebrate are here, at least. An arcade mode which offers story segments for each character and playthrough, and an online mode which was both somewhat populated(!) and had decent netcode. Jumping in for a few games, I never felt like latency was a major concern when compared to the local battles I’d had, and games came pretty quickly, which has definitely been a problem for niche fighters in the past. I feel like this review sounds incredibly negative, which is a shame because that’s not my intention at all, but when playing Koihime Enbu Ryo Rai Rai, it’s hard not to see all the things that could’ve been done better, or have been done better by other studios. It’s difficult, because it’s clearly a more budget title, being offered at a more budget price, but the target audience you can really recommend it to feels small. The fighting mechanics in this are unique and can be used in wonderful ways, but unless you’re specifically in this to get to grips with those mechanics, it’s difficult to see what else there is here for you. Should you invest in Koihime Enbu Ryo Rai Rai? Well, it's a difficult one. If you are the kind of fighting game player that puts more stock in new mechanics than flashy animations - and perhaps really likes anime girls - then Koihime Enbu Ryo Rai Rai is a great package at a decent price on both PSN and Steam. If you're newer to fighting games though, or a more casual player, there's no way I would suggest this game. Not that it's complicated, just neither the most endearing nor visually enticing fighter out there.